I ordered this jacket on a Tuesday through the website which guided me with different shipping options and I choose USPS. On Thursday I received a tracking notification in the morning indicating my package was delivered to me. Was able to pick it up, have my high school patch sewn on and wore it that night. The jacket fits perfect and was a great experience. 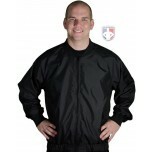 I would highly recommend the jacket and will continue to purchase my official apparel at Ump-attire.com. Thanks again! This fits true to size. 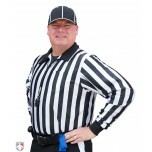 It is very comfortable and is really warm without adding any heavy weight or making it hard to move. 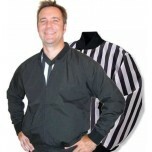 I really like the feel and comfort when wearing this referee jacket. Now it's time to get our logo stitched on it.